Embassy Suites Hotels and AOR Emanate PR created "Vacation More-imization" to help families maximize their summer vacations. Embassy Suites Hotels (ESH) and long-time AOR Emanate PR created “Vacation More-imization” to help families maximize their summer vacations, engage the brand's huge Facebook community of nearly 350,000, and generate positive media and blog coverage. Emanate established a partnership with Parents magazine, which conducted a survey of about 1,800 readers in late April that revealed families are taking shorter (one- to two-night) vacations. “Results reinforced that we needed to help families maximize their vacations by celebrating pre-trip anticipation and post-trip memories,” explains Emanate VP Ryan Murphy. A “Get More Vacation” Facebook contest, media and blogger relations, and a spokesperson deal with well-being and stress management expert Dr. Susan Biali drove engagement and messaging. The Facebook contest ran June 5 to July 20. 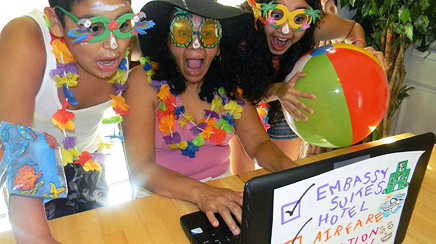 Participants submitted photos capturing the excitement of booking a vacation and explanations of plans to maximize vacation. Five winners chosen by an internal panel got a week's stay at an ESH property and $10,000. Parents promoted the contest on its social media platforms and in its e-newsletter. Thirty-six influential mom bloggers were recruited in May as ambassadors. Free one- to two-night stays at an ESH property gave each firsthand experience of the “more” value proposition. The team also gave them talking points. Outlets covering travel- and mom-related topics were targeted throughout the campaign. Local outlets in the contest winners' hometown markets were also pitched. Biali spoke to reporters and bloggers about the benefits of a vacation and provided tips for maximizing vacation days. She also used her blog and social media channels to drive messaging. In late June Emily Kaufman, a.k.a “the Travel Mom,” promoted the campaign during a co-op SMT and a Travelers' Night In Twitter party. The contest drew 2,519 entries. Impressions on ESH Facebook and Twitter pages surpassed 4 million. Parents reached more than 1.35 million people combined on Facebook and Twitter and through its e-newsletter. Story placements topped 160 (60 million impressions) in outlets including USA Today and Captivate Network. The team is working on a “More Good Company” holiday campaign that kicked off with a road trip on November 11 with comedian Nate Dern of the Upright Citizens Brigade.